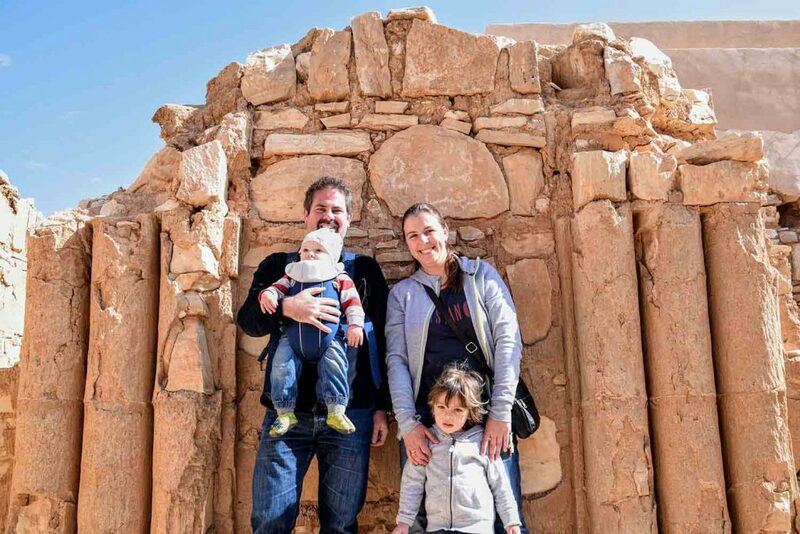 Being bored of his job and looking for a new challenge in life, Bastian from “Living in Jordan as an Expat” decided to move to Jordan with his family. 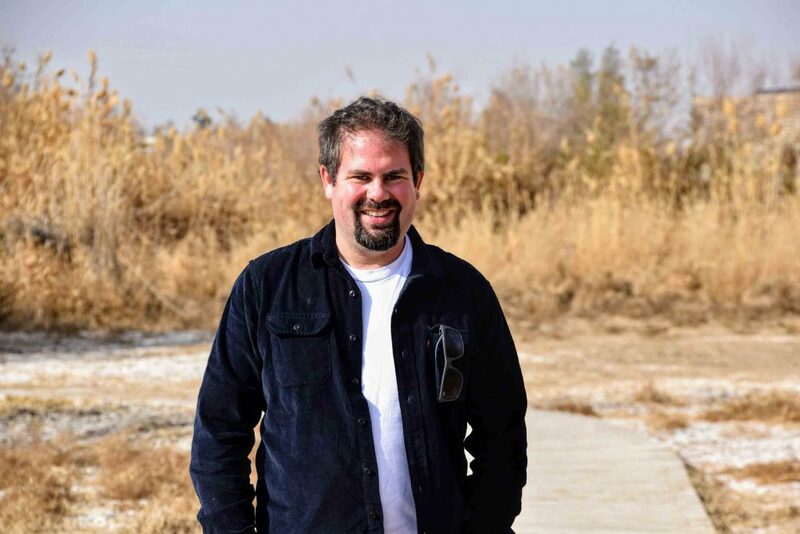 In this interview he shares very useful tips about life in Jordan with a family, his biggest challenges, his favourite local dishes and costs of living. I love nature, music, beer and of course my family. For about 2.5 years we have been living in Jordan and try to make the best out of it. I am constantly exploring new places, be it restaurants, playgrounds for kids or outdoor adventures. I am always on the move. What was the main reason for moving to Jordan? Is it easy to connect with locals or are there any barriers? I wouldn’t say it is easy, since I am not an Arab speaker. Many people in Jordan though do speak English very well and I also learned a bit Arabic. However, it depends on activities. In Jordan, you don’t know what is going on without Facebook. So, even if you don’t like it, you need to join and explore in order to connect to others. If you do, you will find plenty of activities such as hiking, travels, art stuff and much more. 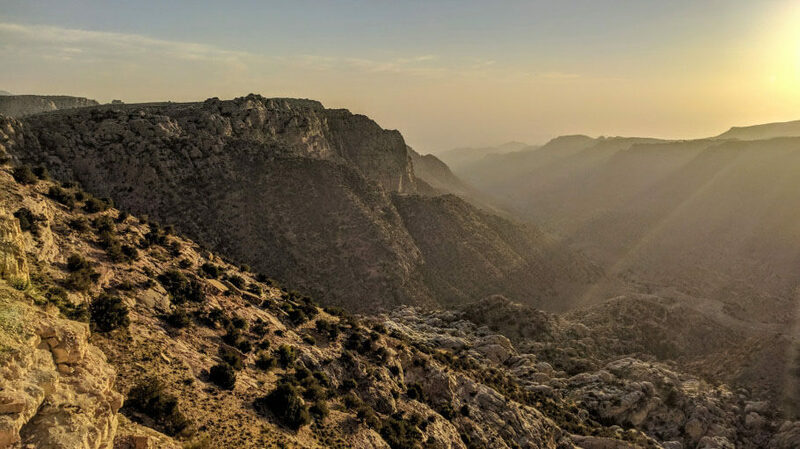 Since it is not so easy to settle in a new country, especially if you don’t speak the native language, I came up with a blog myself to support expats or foreigners of all kind in Jordan. How about the cost of living? Jordan is one of the most expensive countries in the Middle East. Don’t get fooled by the skyscrapers in the UAE. Nearly everything is imported and highly taxed, as Jordan is not producing much. Besides, Jordan has always had a huge population of foreigners, migrants, refugees from Palestine, later from Iraq than from Syria. The fact that the borders to neighboring Syria and Iraq have just recently reopened after being closed for 3-4 years have made things difficult as well. It also depends, in which currency you get paid. As the Jordanian Dinar (JD) is fixed to the USD you won’t encounter any currency exchange inflation if you get paid in USD or JD, different though when you earn your money in EUR as in my case. For more on costs of living in Jordan, renting places and utilities, I would like to point to my blog article covering exactly that topic. What is your favorite and least favorite part about living in Jordan? I have a series on my blog, where people from different nationalities answer exactly that question. My favorite parts of Jordan are the weather, food, and nature. Believe it or not, there are some really nice spots apart from the obvious world wonders and the stunning desert of Wadi Rum. You need to get out of Amman though to experience this. My least favorite part in Jordan definitively is the smoking situation as you won’t find any bar/pub/restaurant without being smoked in. There are only very few places that have some non-smoking section. Driving can make you crazy too most of the times. What I also don’t really like is the absence of awareness towards rubbish. Although much cleaner than Egypt for example, it is still dirty compared to Europe. Unfortunately, in many places people don’t respect the nature and leave their rubbish behind. What was the biggest culture shock for you? It wasn’t much of a shock I would say, as I have been to Jordan before. But there are constant challenges because it is just a different part of the world. I don’t want to judge but I do admit it is not always easy. Let’s say the wheels turn much slower here. Oh… there is too much. I would say Arabic food or Levantine food or whatever you want to call it is yummy. Food in Jordan is fairly similar to Lebanon, Palestine, Syria. However, I have a special connection to the Iraqi cuisine as well. Anyway, the Jordanian national dish is Mansaf, lamb cooked in a yoghurt sauce (Jameed) served with yellow rice. My favorite from Jordan is probably just Shawerma or some good Falafel although the diverse Mezze (appetizers) are all yummy. That’s why usually when you go to an Arab restaurant you order a collection of different plates (Fattoush, Hummus, Tabbouleh, Shankleesh) and then when you are stuffed you try to compete with the grilled meat (Shish Kebab, Shish Tawouk, Tikka). 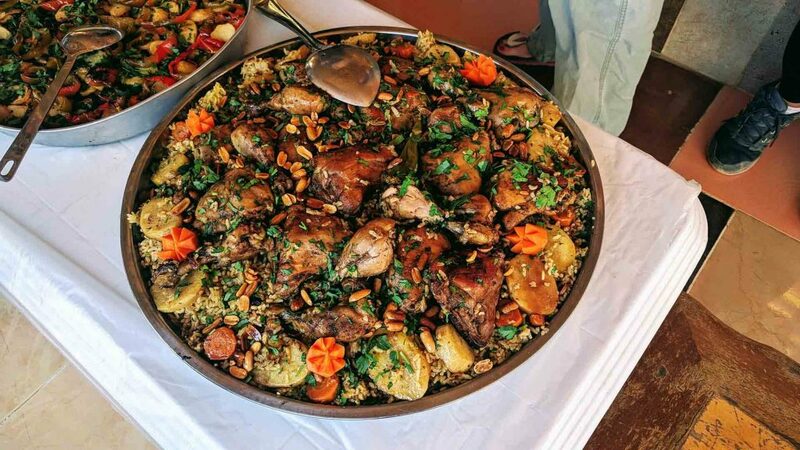 But there are some not so well-known dishes that deserve some credits, such as “Musakhn” a typical Palestinian dish that is chicken on a bread with lots of olive oil, onions and a spice called Sumac or some of the dishes cooked in clay pots are really delicious. 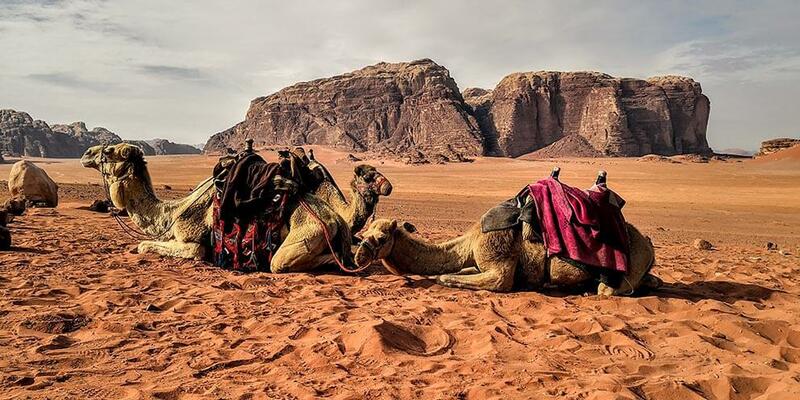 In Wadi Rum you will experience a typical Bedouin meal called “Zarb” which is chicken with a lot of different vegetables and potatoes cooked over charcoal underground! Can you share any funny/typical tradition from Jordan? I am not so familiar with the typical Jordanian traditions to be honest, but surely everything around a wedding and engagement has a typical procedure from asking the bride’s father for the hand of the daughter, over special engagement parties to the wedding ceremony with music dance, food and so on. Another tradition when people are getting married is that they invite their friends to the Hammam (Turkish bath). Of course separated. The bride with her female friends and the groom with his male friends. 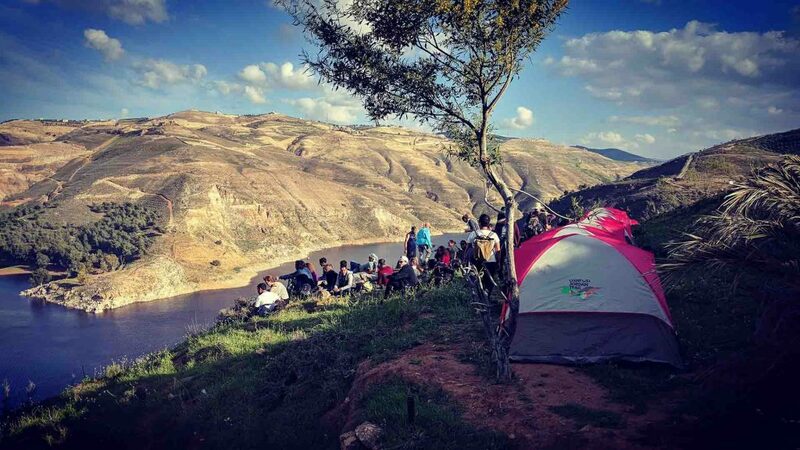 One typical tradition is maybe that you can observe Jordanian families nearly all year-round having BBQs and gatherings sometimes in locations which we would not necessarily consider attractive such as at the site of the highway. 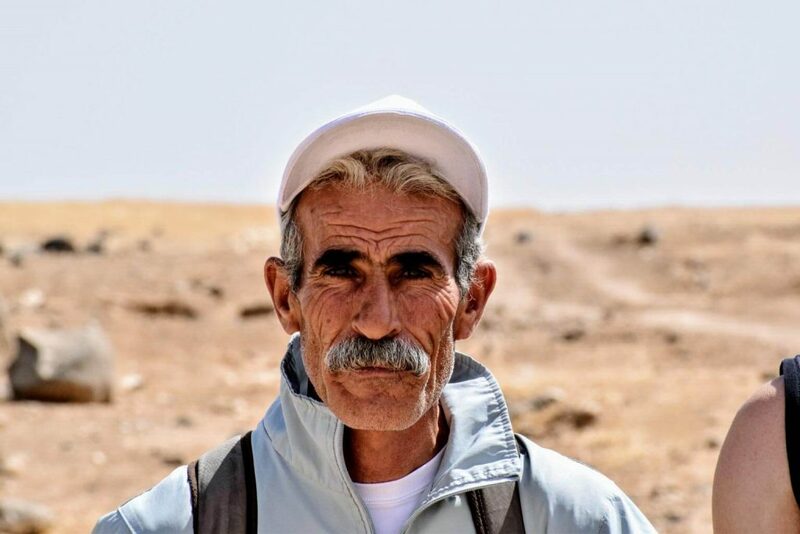 What is the most annoying stereotype about Jordan people that you found out not to be true? To be honest, I don’t know what people in Europe think about Jordanians. Maybe people probably don’t even know exactly where the country is and we heard many more news about Iraqis and Syrians in the recent years. Either way they are a very young Arab nation with lots of struggles and difficulties due to water scarcity, geographical location, political constellations, so they face many challenges. But Jordanians are well-known for their hospitality and welcoming culture. That’s why you will always hear “Welcome to Jordan”. 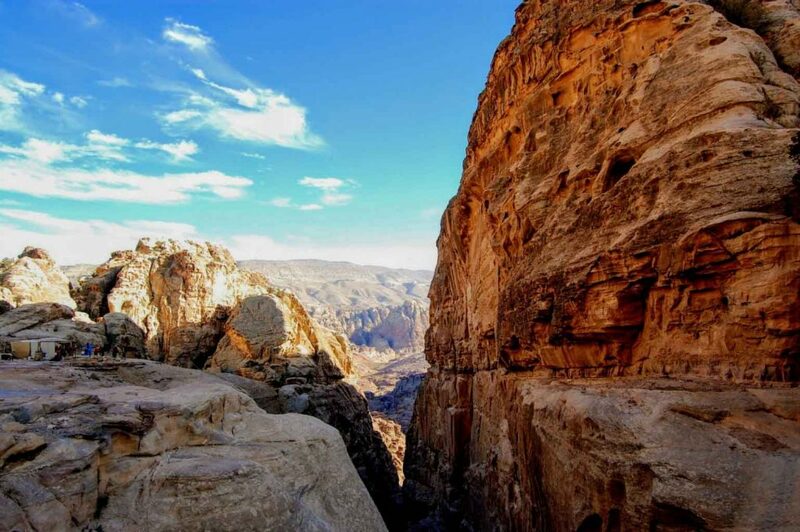 What is your favorite thing to do in Jordan that people should do if they visit? Well, most of the people would think about Petra, one of the world wonders and, of course Wadi Rum, which is an exceptional place. For me, the desert with its silence and wide open spaces next to rocky mountains and the possibility to sleep under the stars without hearing any car, animal or human, is just amazing. However, I would love to point out that just recently Jordan has a lovely new Hiking Trail that runs through the whole country from North to South covering all the different regions and types of nature. 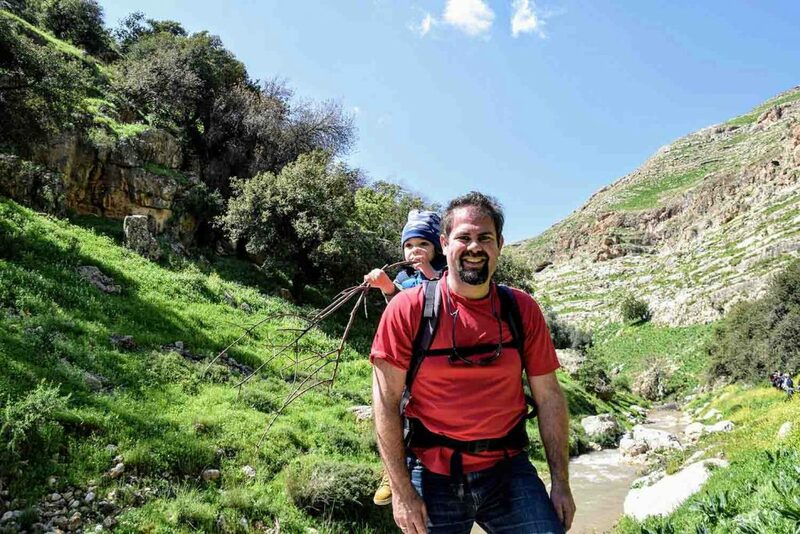 So, if you are into hiking and nature, and would love to see a more greener part of Jordan, make sure to check out the Jordan Trail as you can also hike parts of it, be it for a day or a weekend, guided or on your own – with caution. 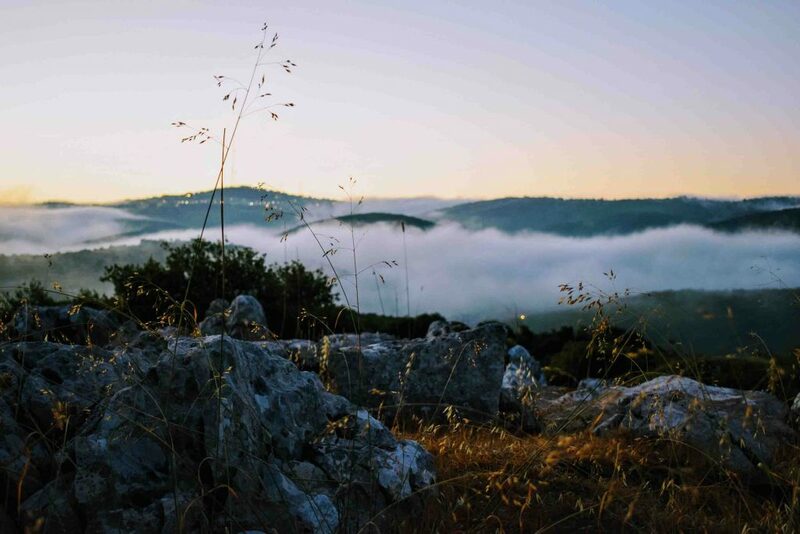 You can also do cycling tours or hike through some green valleys with thousand-year old olive trees. What was the biggest challenge for you once you moved to Jordan? Well, even though it is not as far as Australia, it is a considerable distance from Europe and flights are pretty expensive and usually only take off and land in the middle of the night. Just recently in 2018 Ryanair started to fly to Jordan from several European destination. However, from Germany you can only fly from Cologne to Aqaba, there is no direct flight from Germany to Amman with Ryanair, so you usually have to opt for some of the more expensive airlines to see family and friends back home. Other challenges are finding some kids-friendly environments. Jordanians love kids, they have a lot of them, but the infrastructure is not always kids-friendly, especially when it comes to toddlers or babies. Anyway, I have been exploring a lot of places and posted about what to do with kids in Amman. What is/are a fun fact(s) about Jordan most people don’t know about or expect? I haven’t received a single letter since I am here. They do have building numbers, but barely anybody refers to a concrete address rather than some landmarks in the area. This can make orientation a bit complicated and even to be picked up by Uber is not always easy. Anyway, after a while you can figure it out. If you are new in Amman and need some orientation. It is definitely not Gummi Bears, Kinder chocolate or Maggi Soups. I think it is just being able to go out of your home and take a walk, which is nearly impossible in Amman due to non-existing or bad sidewalks, the hilly landscape, obstacles and the pollution of the cars. What would be your top advice for people who are thinking to move to Jordan? Be open minded, accept that the country with its people and culture is probably different to your home country, but that you will meet some great people, in a diverse country with awesome weather most year-round and excellent food. Also, there are some great natural treasures as mentioned above. But be warned, it is an expensive destination so take that into account. You can also find Bastian on Facebook, Instagram and Pinterest. You can find more expat stories on my blog. This entry was posted in Expat Life, Expat Stories. Bookmark the permalink.